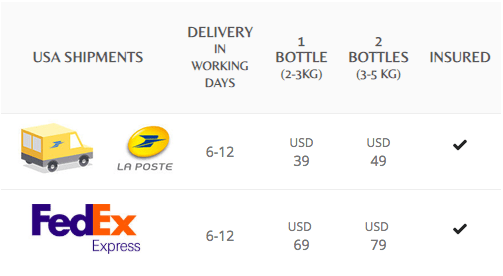 Shipping details and conditions for orders made at www.cognac-expert.com. The goal of Cognac-Expert is to ship worldwide where possible. If your country is not listed, please message us at shop@cognac-expert.com and ask for details. All customs & import taxes are handled & included in the shipping costs. LImited States: Maximum 2-4* bottles per parcel. Customs may apply: Alabama, Arkansas, Massachusetts, Mississippi, New Hampshire, Pennsylvania, Utah, Wyoming, Iowa, Kentucky, North Dakota. The following chart gives a brief overview of shipping. For further details please read the additional information listed below the chart. We cannot ship to PO boxes or US Military Bases. 12-13 No customs apply. Including EU VAT. 18-19 No customs apply. Including EU VAT. 20-21 No customs apply. Including EU VAT. 25-27 No customs apply. Including EU VAT. ** Important: Your order may be subject to local taxes & fees which are not handled by Cognac Expert. For final delivery charges, add the desired products to your cart and proceed to the next step. You can see the costs without registering or entering all your details. Delivery fees depend on quantity, value, weight, and destination and will be shown at checkout. We ship rare cognac from France to your doorstep. Like the aging process of cognac in the barrel, shipping to you takes time. Our charges vary widely across different destinations. As we ship directly from the region of Cognac, France, our parcels will take some time to arrive. We use the latest technology to monitor every parcel, and will contact you and/or the postal service in situations where delivery might be out of normal expectations. For orders to the USA we pay all customs and import fees. For orders outside the EU and all limited states of the USA, we generally recommend not to ship more than 3 bottles per parcel to avoid additional custom fees. Every order is packaged very securely to avoid damage. Items above 100€ (tax excl.) are packed without any additional costs. For items costing below 100€ an additional 3 Euro (per item) is charged. For items below 50€ an additional 5 Euro (per item) is charged. These costs are shown together with the shipping costs at checkout. Shipping spirits across borders is complicated and in some circumstances be subject to additional time and fees for customs and import taxes. Orders to the USA are 100% hassle free, and the whole import and customs is handled by Cognac Expert. Prices exclude European VAT - this will be shown at checkout. US Customs charges are already included within the shipping fee charged. In order to provide this easy shipping service, customs clearance and payment of duties, fees, and taxes is serviced through our shipping service provider. Total costs are displayed at checkout. Your order may be subject to local taxes. We cannot be held responsible for any delay, blocked parcels, or seizure at the level of local customs, or any other import/tax authority. It is the responsibility of the client to communicate with, and/or clear customs, cover any fees, duties, or taxes should they occur. Prices includes French (European) VAT if not other stated. To our knowledge, import or additional customs fees are not applied. However, our terms & conditions apply. Prices currently include European VAT (we are working to change this.) Your order may be subject to local taxes. We cannot be held responsible for any delay, blocked parcels, or seizure at the level of local customs in the receiving country, or any other import/tax authority. It is the responsibility of the client to communicate with, and/or clear customs, cover any fees, duties, or taxes should should occur. A potential (but rare) procedure is that Canadian customs return the package to the sender. Another (extremely rare) potential procedure could be that Canadian customs and/or the Canadian postal service decide to destroy the product because of "flammable goods". We emphasize that we can neither guarantee specific delivery dates nor delivery time frames. Please be patient while we get your order to you as soon as is humanly possible. Delivery time frames for orders of Old Vintage, Collection, Reserve, Prestige and, Hors d'Age +50 years old cognacs are not guaranteed to be delivered within the parameters stated in the above chart. All orders (excluding shipments to limited US states) are shipped with global shipping companies (e.g. FedEx) and are insured against any damage or loss. However, it is the responsibility of the customer to provide a valid and reachable shipping address that is able to receive the parcel. We cannot be held responsible for an incorrect or insufficient shipping address that results in a failed delivery. Also, we cannot be held responsible for a failed delivery because of a refusal to accept the parcel. Limited US states: Please note that Cognac Expert cannot be held responsible for undeliverable items. If the shipping service is unsuccessful in delivering the parcel it will be returned to sender. Such a situation is the responsibility of the customer who has either provided an incorrect or insufficient shipping address and/or wasn't available to receive the parcel. The costs of return are paid by the customer and are depending on weight/size and shipping destinations. As the product has been imported into the USA the costs for non-delivery are very high. The minimum cost to return to sender is US$120 - but can be higher. In the case of a failed delivery the purchase amount of the product, minus the cost of the return, will be refunded once the sender has received the product back. Alternatively, the parcel (once returned to sender) can be re-shipped on receipt of a new shipping fee being paid by the customer to Cognac Expert. The return fee is the same amount as the initial shipping costs. In the case of a failed delivery the purchase amount of the product, minus the cost of the return, will be refunded once the product has been received by the sender. Alternatively, the parcel (once returned to sender) can be re-shipped on receipt of a new shipping fee being paid by the customer to Cognac Expert. The return fee is the same amount as the initial shipping costs. In the case of a failed delivery the purchase amount of the product, minus the cost of the return, will be refunded once the product has been received by sender. Alternatively, the parcel (once returned to sender) can be re-shipped on receipt of a new shipping fee being paid by the customer to Cognac Expert. We send a large amount of cognac bottles and it’s very rare that any get damaged. Please inspect your parcel on arrival for any visible damage of the package in the presence of the delivery person. In the unlikely event of visible damage, please DO NOT refuse the package. Instead, you need to declare damage to the delivery person who will provide you with written confirmation of the damage. In case of damage, and in order to claim a refund or a replacement, you have to report the damage within 48 hours from receipt of the package. Please send an e-mail to claim@cognac-expert.com with the following details: Order reference/invoice ID, date and time package received, photos of damaged goods, written confirmation from delivery person of damage). You will receive a reply to confirm that your claim has been received. We will arrange for a replacement to be delivered as soon as possible. Please note: If you send the claim more than 48 hours after arrival of the shipment, we will not be able to refund or replace the broken or damaged goods. At the end of March 2018, restrictions came into place regarding the shipment of alcohol to many US states. Cognac Expert, along with all other beverage retailers, has been affected by these unexpected changes. Currently around 30 states are affected – we call them "limited states". The upshot of this ruling is that we will no longer be shipping to these locations via FedEx. Instead we will be using the French postal service, La Poste. This is being implemented to assist customers to receive their purchases without having to pay customs duty. However, please be aware that using La Poste for shipping does not guarantee that unforeseen customs duty will not be imposed. In such cases any such fees will be the responsibility of the purchaser, and not Cognac Expert. For further insight into this subject we recommend this article published by the New York Times. If you have any questions or concerns, please do not hesitate to contact us at shop@cognac-expert.com. Please be assured that your business is valued, and your understanding is appreciated.